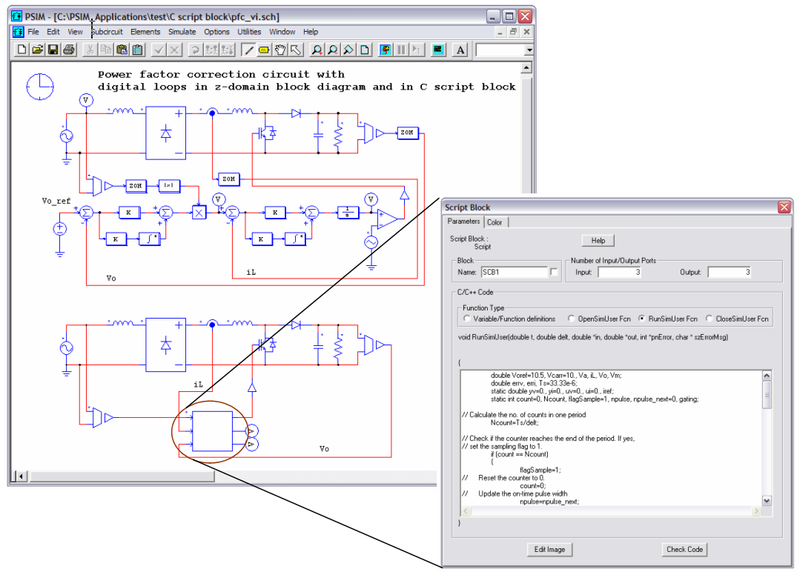 PSIM from Powersim Inc. is a simulation software specifically designed for power electronics and motor drive systems. It features an intuitive and easy-to-use graphic user interface, fast and robust simulation engine, and provides a powerful simulation and design environment for switchmode power supplies, power management, analog/digital control, and motor drive systems. "We greatly appreciate the power and flexibility of a C interpreter bring to the simulation and design of power electronics and motor drive systems. An embedded C interpreter makes it extremely easy to write C code in PSIM without the need of a separate C compiler. The response from our customers on the C Script Block in PSIM, powered by the Embedded Ch interpreter, is very good. Thank you for a well-developed product." Hua Jin, president of Powersim Inc. The Ch interpreter embedded in PSIM greatly enhances PSIM's capability and flexibility in control simulation and device modeling. With this feature, users can implement a control scheme in C code, and enter the code directly in the PSIM environment. Also, it allows users to model a device or functional block using the powerful C language. As an example, the diagram below illustrates how the Ch interpreter is used in PSIM. The circuit on the top shows a boost power factor correction circuit with the control loops in z-domain block diagram. The circuit on the bottom shows the same circuit, but with the control loops implemented in the C Script Block powered by the Ch interepreter. (click the above image to see an enlarged one).